Alec Freeman has had a pretty rough deal at the hands of authors in the past. 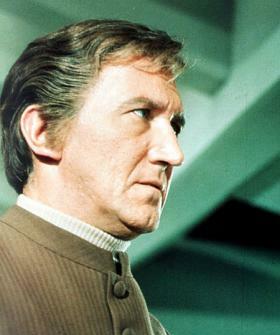 A considerable amount of the fanfic that has been written seems to have dragged the character of Freeman away from the man who was portrayed by George Sewell, and more often than not all that we are left with is a thin and almost comical shadow of one of the most powerful and certainly influential characters in the UFO series after Ed Straker. Alcoholic and incompetent, a lecherous womaniser and Australian to boot, and what is more, some writers even boast about the way they depict him. What did Alec Freeman ever do to deserve such treatment? What is worse is that this vision, this flawed adaptation of Freeman has become contagious, like some plague that infests writers and makes them distort the character so that he is no longer the person we saw on the screen. All it took was one writer to start that idea, whether erroneously, or by deliberate intent and others picked it up and ran with it. It’s called Memetic Mutation; the spreading of a “meme” version of a character which goes against the original depiction. Memes can, and do, spread like wildfire, despite being totally at odds with the character’s ‘reality’. The false notion that Alec Freeman was an Australian was accepted by many fanfic authors and became popular throughout the fanon. Of course new writers, who might only have been dipping a toe into the world of UFO to test the water as it were, often continued the falsehood, and so the meme became fixed in the fanon to the extent that it became the accepted version, supplanting canon for its own skewed vision of the UFOverse. I am even guilty myself. ‘And good morning to you too, Ed.’ Alec Freeman’s laconic Australian drawl contrasted sharply with Straker’s clipped American pronunciation. ‘You can blame it all on me. ’ (Lightcudder. Process of Elimination. 2009. Chapter 1). When I started writing fanfic in the Gerry Anderson fandom, I was fortunate enough to have all the Thunderbirds dvds, but the last time I had watched UFO was a single episode of Sub-Smash in 1980. So my memories of the UFO characters were blurred and inconsistent, although I did have my well-read Robert Miall novels. I devoured the stories that were out there and read everything I could find before I finally dared put pen to paper (well, fingers to keyboard). And looking back later I realised that I had got it all wrong. Straker with silver hair, Keith Ford a useless and bumbling idiot, Paul Foster (and my sincere apologies Paul!) a cocky upstart with ideas above his station. But, of all the characters apart from Straker, Alec appears to have suffered most in the stories that are out there. I am not the only culprit, far from it, although I do have to say that I was influenced by reading other writer’s accounts of Alec Freeman, and I am not proud of the fact that I got it so wrong. In fact I am in the process of re-writing some of my earlier stories simply to make them more in tune with the episodes. So, here is my apology to Alec (and George Sewell, a great actor who brought Freeman to life). Alec Freeman is not an Australian. How can he be? He has a perfect English accent, almost Queen’s English. Beautiful diction and, as Ed Bishop stated, ‘He had that quick London way of speaking and I had a slower kinder of American delivery..’ so my description of Freeman’s slow Australian drawl was completely mistaken! Where does that idea originate? These are two instances that I found in the first book, although doubtless someone will find another one. The problem is that Miall had to get that idea from somewhere before he passed it onto gullible readers and future fanfic writers. He has a lot of explaining to do! Miall’s books seemed to be little more than a quick gimmick to try to cash in on the popularity of UFO and as they appear to have been written in haste they are full of flaws and misconceptions. His characterisations are skewed and there are other erroneous facts in the novels that are again promoted by writers through their own fanfic. Alec Freeman passes through doors. FREEMAN: Hello there George. The boss in? FREEMAN: (very Australian) I don’t like it. These clouds give as much cover as the g-string on a bloody belly dancer. FREEMAN: It’s my natural Aussie charm coming through. It always does when I sweat. Do those scenes sound familiar? No? Of course not. They were either deleted (scene 49) or moderated to remove the word ‘bloody’ as well as deleting the reference to being an Australian. Furthermore, Sewell himself stated: ‘I was surprised to see him described as an Australian in the first script, but I didn’t play him as an Australian.’ So Alec Freeman is English. Canon. And to say otherwise is foolish. I wonder whether Star Trek fans would happily go along with writers describing James T. Kirk as Scottish (after all he does have an Anglo-Scottish surname!). I think not, yet UFO fans seem happy to accept stories where the second most influential person in SHADO is written as a buffoon. It denigrates a fine actor as well and George Sewell deserves better. There are many examples of the power of ‘fanon’ in making Alec Freeman an inebriated lecherous incompetent, and I am sure that if you read any UFO fanfiction you will be aware of them, so I will spare you the details. Perhaps we should look for stories where Alec is seen as he was portrayed in Sub-Smash or Confetti Check A-O.K. The dependable, loyal and intuitive friend who is there when most needed. Okay, I admit that he flirts with Miss Ealand in Identified, and waves at Lt Johnson. And makes a pass at Virginia Lake, but there is NOTHING in any of the other episodes. Let’s face it. Identified was the pilot. The characters were raw and unformed and both Straker and Freeman’s characters changed considerably in the following episodes. Gerry Anderson commented that Alec Freeman seemed to have a fascination for women’s bottoms, but in reality, Anderson himself was the one who directed the cameramen to focus on various ‘behind’ shots of the tightly clad female operatives. But in a lot UFO fanfic Alec Freeman comes over as an over-sexed womaniser. And again, readers will have no problem finding examples in the stories that are out there. But where is the evidence in the episodes that Alec Freeman was sexually rampant? He was a flirt, that much is obvious, but, like Straker, he was a disciplined military man, and would never have mixed ‘business’ with pleasure, certainly not while on duty. Perhaps, as someone suggested, he was not all that successful around women (in Court Martial we see that he sleeps alone), and his ‘flirtatious’ behaviour might have been a front to hide his insecurity. Perhaps he was self-conscious about his appearance. There were plenty of opportunities for the scriptwriters to show Alec Freeman with a girl friend, as they did with Paul Foster, but they chose not to. Why? Simple. Because Alec Freeman was a loner. He was the reliable, steadfast and ‘solid’ counterpart to Paul Foster’s outgoing social party animal. And more importantly, he was the one person who Straker could rely upon to be there, the ‘human’ face of SHADO. Somehow I cannot see Ed Straker, solitary, diffident Ed Straker, having a best friend with the morals of an alley cat. Now for the drinking. Sigh. And yes, I admit, I had Alec Freeman enjoying a malt whisky in FarSight. Why not? He didn’t get drunk and I made a point of emphasising the fact that he did not need alcohol. But, some writers revel in making Alec even more useless by making him a drunk. Get real. A alcoholic with the second most important job in the world? How many REAL alcoholics do these writers know? Drinking a glass of whisky during the day does not make you an alcoholic and at the time UFO was filmed, it was common practice to drink during the day, even after work before you left for home. Alec had, what, four or five drinks in Straker’s office during the whole series? Not as if he was imbibing constantly. And yet, again he is portrayed as the man who needs alcohol. I seriously doubt that Alec Freeman would drink while on duty. We never saw him with a drink while he was in the control room, and there is no concrete evidence that he was still ‘on duty’ when he was drinking. In Identified for example, although he is in the office, Straker has ‘sent for him’ which could imply that Freeman was off duty. Just a thought. Service in the Royal Air Force is more than just loyalty to the Crown, military superiors, subordinates and comrades. It also involves the respect for others and a sense of pride. Self-respect means to have a proper sense of your owndignity and integrity. To have self-respect is to value yourself as aprofessional and as a human being, and underpins our attitudes to sexualbehaviour, drugs and alcohol. People with self-respect have high personalstandards of social behaviour and do not behave in ways that bring discreditupon themselves, their comrades, their unit or the Royal Air Force. And I am convinced now, that Alec Freeman, ex-fighter pilot, Military Intelligence officer, SHADO Colonel and, more importantly, best friend of Commander Ed Straker would uphold those standards. So, my sincere apologies, Colonel Freeman, for portraying you in such a poor light in the past. I hope that I have made amends in The Shepherd. As for the real Alec Freeman? I think that this extract from Sign of Aquarius sums him up perfectly. The hallway outside was much darker than the brightly lit treatment room and it took him a moment to adjust and see where the group of people had moved. He advanced on them, and someone dropped like a shadow to a place at his left, a brief touch on his upper arm, and suddenly he knew that Alec was there. The relief was so strong he almost faltered. Alec Freeman. There, when he is most needed. Not the womaniser, the drunk, the buffoon. Instead we see the sober friend, the competent Colonel and above all the one person that Ed Straker knows that he can rely upon. Which, after all, was the whole purpose of Alec Freeman’s role in UFO. So, when you read a UFO story, just take a moment to think to yourself. Is this Alec Freeman? The ‘real’ Alec Freeman? Or is it merely an writer’s cheap shot at making a fool out of a man that Gerry Anderson himself called ‘heroic’. Once again Alec, I give you my apologies. I am re-writing (as fast as I can! ), and when I have finished, I hope that my stories will show Colonel Freeman as he really was. Captain James T. Kirk scratched his hairy thigh and wondered, not for the first time, why he was forced to wear a kilt that itched so much. ‘Och aye the noo,’ he complained in a broad Glaswegian accent as he knocked back a triple Scotch before reaching out with one hand to grab Lt. Uhura by the waist and pull her onto his lap, where he proceeded to paw at her body even while he was kissing her with great enthusiasm. Doesn’t sound like Kirk at all, does it? So why do we accept an Alec Freeman who is treated the same way? First published in The Ed Straker Herald, Oct 2011 Copyright LtCdr. This entry was posted in 8. Articles by Administrator. Bookmark the permalink. I totally agree with what you say about poor old Alec Freeman. So often misrepresented in fanfic. And it really bugs me that people claim he’s Australian – George Sewell had a lovely, soft London accent (not the awful, grating, loud-mouthed ‘cheeky Cockney’ we’re usually subjected to) and certainly NOT Australian. He was a wonderful actor who gave a real warmth and integrity to Alec. Alec is Straker’s right hand – solid, dependable and loyal. But he is also the human face of SHADO. Always backs Straker when he needs it but also softens his commander’s approach, particularly when dealing with other people. He is extremely professional and disciplined, not a drunken old letch. Alec Freeman is my second favourite character in UFO, behind Straker and just ahead of the fabulous Jackson! – now there’s another character who is often misrepresented. Most people continually go on about Straker’s dislike and mistrust of the good doctor but clearly, as the series progresses, Straker warms to Jackson and comes to trust his professional judgement – even seeking his advice on a number of occasions and completely trusting him to care for Catherine Frazer. And if Straker trusts him then that’s it as far as I’m concerned. But I digress, as I often do when it comes to Jackson! Back to Alec Freeman – thank you for doing your bit to correct the damage continually being done to this wonderful character. I can only hope that other writers pay heed and start to treat him much more respectfully. As ever, I am extremely impressed with your insight into these characters and the interesting way you write about them. In my humble opinion, you are quite simply the best writer in the UFO fandom. I haven’t found any others who even come close! PS l love the image of Captain Kirk in a kilt, knocking back the scotch and snogging Uhura “with great enthusiasm” – but then again who wouldn’t jump at the chance to don a kilt if it gave them the opportunity to snog Uhura!